Whether they’re snatching salmon or ranging the tundra, wild Alaskan brown bears regularly inspire our conservation work for the species down here in the Lower 48. But it’s easy to forget that Alaska’s bears need protection, too. 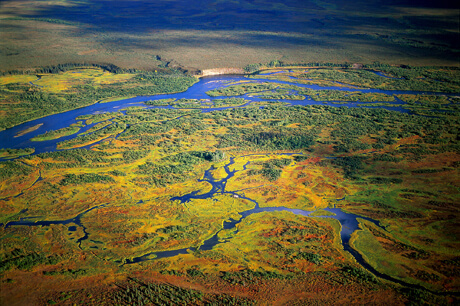 That’s why the Bristol Bay Heritage Land Trust—a fellow member of the Land Trust Alliance—worked to secure a conservation easement on 530 acres of bear and salmon habitat at the confluence of Harris Creek and the Nushagak River in Southwest Alaska. 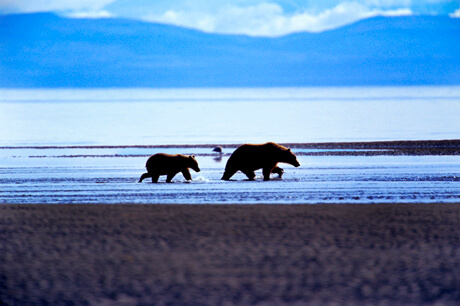 We were excited to help protect an important feeding site for these magnificent coastal bears, so that they can keep inspiring our work farther south. Five acres may not seem like much, especially in a state the size of Alaska. But when those five acres comprise a private inholding straddling a salmon-rich creek within a national park, their importance is not small at all. That’s why we were quick to support The Conservation Fund in purchasing the Priest Creek inholding in south central Alaska’s Lake Clark National Park. After completing the acquisition, TCF deeded the property to the park, ensuring unified management and that it will remain an undeveloped brown bear sanctuary for generations to come. 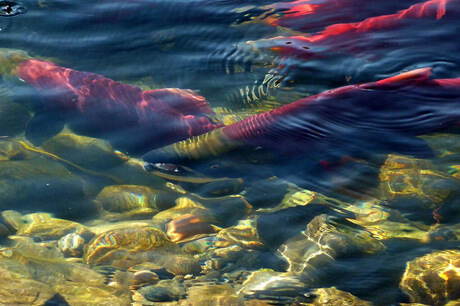 On the edge of Katmai National Park in south central Alaska, the Alagnak River runs red with salmon each year. 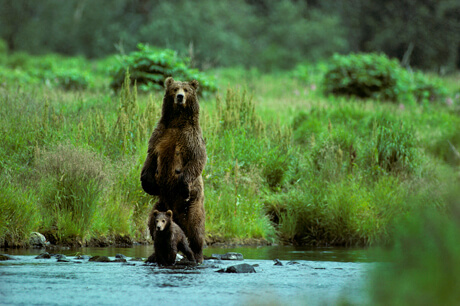 Its brown bears, nitrogen-rich soils, and the ecosystem they support reap the benefits. So we were excited to support The Conservation Fund’s acquisition of 100 acres along this waterway, ensuring this wildlife haven remains undeveloped alongside the Alagnak’s designated wild and scenic river corridor. 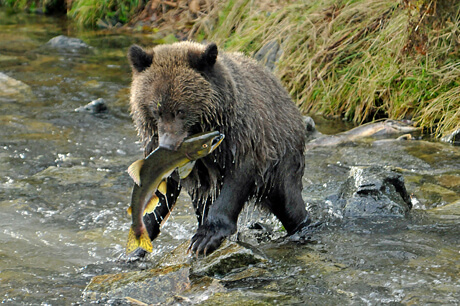 In remote southwest Alaska, the timeless cycle of salmon runs and brown bear feeding continues with little outside interruption. While grizzlies fight for a foothold in the Lower 48, we know it’s also important to keep an eye on the big wild of the Last Frontier, ensuring that development does not leave its wildlife with the fragmented reality faced by so many species farther south. Conserving private inholdings within large public-land areas removes potential conflict sites and keeps these wilderness sanctuaries uninterrupted. 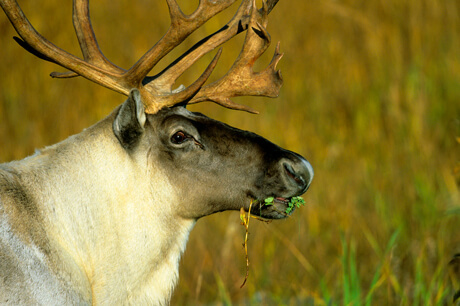 That’s why we gladly contributed to The Conservation Fund’s effort to acquire and conserve three private parcels within the stunning 4,000,000-acre Togiak National Wildlife Refuge north of Bristol Bay. Two lie on Goodnews Lake and the third nearby along the Togiak River, with each offering rich riparian habitat for fish, bears, and a host of other native species. Bordering Togiak National Wildlife Refuge to the northeast, southwest Alaska’s smaller Wood-Tikchik State Park remains critical salmon and trout spawning habitat within the larger Bristol Bay fishery. It’s also a favorite place for public recreation on the edge of enormous wilderness. So we gladly supported The Conservation Fund’s effort to conserve two private inholdings from development within the park. The first, a 241-acre parcel on the Agulowak River, directly protects fish habitat, while the second, a 110-acre chunk of shoreline on Lake Nerka, keeps a wild lakeshore undeveloped, preserving the park’s wilderness character for the benefit of people and wildlife alike. Separated only by a narrow strait of ocean, Afognak Island is Kodiak Island’s smaller northern sibling. But the brown bears are no smaller on Afognak, and they face the same risk of overdevelopment encroaching their finite habitat. 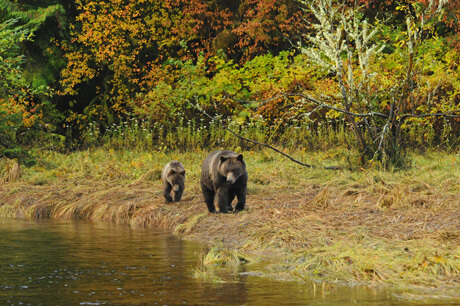 That’s why we gladly supported the Kodiak Brown Bear Trust’s push to acquire and conserve a sizeable 4,400-acre chunk of prime bear habitat along Perenosa Bay, on the northern tip of Afogank. With other key partners including the Rocky Mountain Elk Foundation and the American Land Conservancy, this was truly a team effort from far and wide to support a vital piece of habitat for some of the most iconic bears on the planet. Uyak Bay cuts deep into the wild western coast of Kodiak Island, its lagoons and steep shores hosting a teeming fishery and the massive brown bears that share it with many other species. We were eager to lend a hand in protecting these prolific grizzlies as we supported the Kodiak Brown Bear Trust’s purchases of two critical 10-acre private parcels that threatened to interrupt bear habitat in this remote portion of the island. Our first partnership in Alaska took us to the rugged southwest coast of Kodiak Island, where majestic brown bears continue their time-tested role of devouring salmon and other native fish then spreading their nutrients far and wide through the rugged coastal ecosystem. 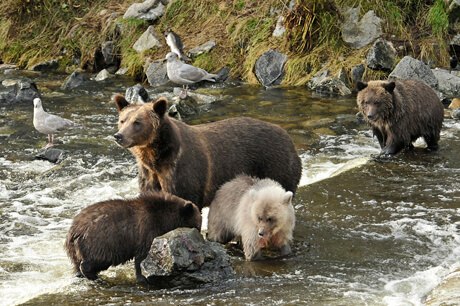 For these bears to remain such wild ambassadors for grizzlies worldwide, their habitat must not be encroached by overdevelopment of the island, which supports a large commercial fishery. Our partners at Kodiak Brown Bear Trust work to ensure this balance between people and wildlife by protecting habitat and funding research and public education. We were glad to kick off our relationship by supporting the trust’s acquisition of 145 acres of rich bear habitat near Sturgeon Lagoon.